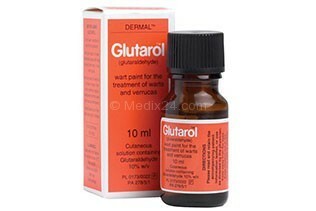 Glutarol contains an active ingredient called glutaraldehyde. This ingredient kills the virus that causes warts and it also dries the wart and surrounding skin. This helps to prevent the infection from spreading. Effect: kills the virus that cause warts and dries the wart and the surrounding skin. Be careful: the virus that causes warts is very infectious. Be sure to treat it on time.